From sunrise to sunset, Angkor Wat is one of the most majestic places on earth. Hidden in the jungle for nearly 900 years, this Buddhist and Hindu temple was the centerpiece of the ancient Khmer Kingdom. With towering spires reaching towards the heavens and intricate carvings covering the inner walls, a visit is sure to bring out your inner Indiana Jones. A helicopter view of the Angkor Wat and the surrounding moat and jungle. When I first visited Angkor Wat in 2009, I left feeling like I had unfinished business. “Angkor Wat was the first stop on our whirlwind three day tour of the Angkor complex that consists of dozens of temple ruins scattered over more than two square miles. While it was smaller than I imagined (as I feel most famous monuments are), the place was absolutely amazing. Filled with intricate carvings and stone wall reliefs telling stories, it was the five central towers that really make the site special. When I returned in November, 2013, I took my time exploring the ancient ruins. Hours turned into days, as I climbed over giant carved stones and photographed every inch of the massive complex. Now, I’m thrilled to take you on a photographic tour of Angkor Wat. While everyone flocks to the eastern reflecting pool, you can find great photo opps in the west. Wipe the sleep from your eyes; you’ve just woken up at 3:30 am. Across Siem Reap, bar patrons are saying goodnight; but, you’ve already hopped into a pre-arranged tuk tuk and begun the journey to Angkor. In the still of the night, you are alone with your thoughts as you pass by the still-closed ticket office. Allow yourself to be transported back in time, as the sight of parking lots and tuk tuk drivers fades into a sprawling complex of stone and history. There’s nothing quite like that first view of the Angkor Wat towers, as you pass through the front gate and begin to walk down an uneven pathway. The main entrance to Angkor Wat. The main walkway to Angkor Wat is a beautifully reconstructed stone path. Upon arriving at Angkor Wat, you find only a few signs of life; including a pair of sleepy-yet-jovial ticket checkers, who declare you the first tourist of the day. That’s OK… you don’t want anyone around anyway! After walking to the reflecting lotus pond, finding a perfect spot to set up your tripod and ordering an hot cup of coffee, all that’s left to do is wait and watch as night gives way to day. An 11 minute star trail exposure of Angkor Wat. Taken at 4:32am with a Nikon D800 at 17mm, f/5.6, ISO 200. Angkor Wat is especially mysterious in the hour before sunrise. Water lilies and lotus flowers fill the pond in front of Angkor Wat. The lotus pond is a great place to catch a sunrise reflection of Angkor Wat. The classic view of Angkor Wat and the reflecting lotus pond. Remember how tough it was to get out of bed at 3:30 am? As you stand in your prime position along the water, more than a thousand people will fill in the gaps behind you. Now imagine being in back of that mob instead of the front. Aren’t you glad you woke up early? The sunrise scene on November 29, 2013. Moments after the sun peeks out from behind Angkor Wat, hoards of tourists begin heading back to their hotels or to nearby food stalls for breakfast. As such, this is the perfect time to wander around the outer courtyard and bathe in the early-morning light. The outer walls of the complex make a great backdrop for a portrait. I love the long shadows that cut across the courtyard in the early morning hours. The outer western wall of Angkor Wat is bathed in golden light just after sunrise. Leading up to your trip, rumors have trickled in of scaffolding covering Angkor Wat. Much to your delight, you find that only a small part of the temple ruins are covered at any given time. To show this, here are are a pair of photographs of the front entrance from 2009 and 2013. The front entrance to Angkor Wat: free of scaffolding in 2009. The same entrance four years later, under moderate renovation. Whether you use the front entrance or one of the many side doors, you will find yourself in a long column-lined hallway. This area is known as the outer gallery; and its walls are covered with thousands of exquisite bas-relief carvings. The bas-relief carvings in Angkor Wat tell the story of the Hindu epics of the Ramayana and the Mahabharata. Don’t forget to look up while gazing at the carvings. Large columns line the outer gallery hallways. The carvings of Angkor Wat are among the best maintained in the world. Shield your eyes; the transition from Angkor’s dark galleries to the bright courtyard comes quickly. After climbing a few stairs and stepping into the open, take a few minutes to admire the massive temple towers above. Looking up at the central towers. I can only imagine the awesomeness of going to a special event in the inner courtyard of Angkor Wat! Depressed courtyards such as these can be found in all four corners of the second floor. I’m glad I took this photo on 2009, because when I visited Angkor Wat in 2013 the same scene was packed with tourists. The entire second floor is surrounded by a walkway with columns covering the windows. Catch your breath … you’ve just walked up a steep set of narrow wooden stairs and reached the tippy-top. Waiting for you is the central tower — the big boy — the main event — the centerpiece of Angkor Wat. The center tower of Angkor Wat. It’s a steep climb to get to the top of Angkor Wat. Note the incredible carvings that cover the central tower. 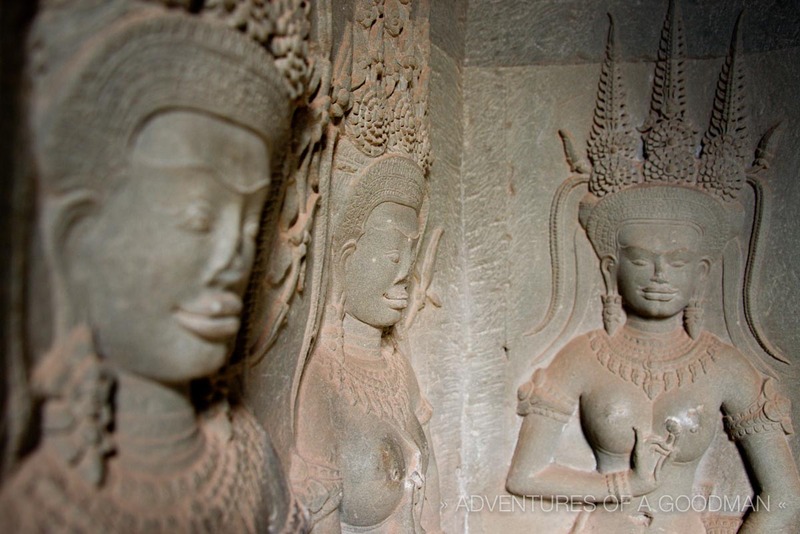 Beautiful carvings adorn the walls of the top floor of Angkor Wat. The top floor of Angkor Wat towers above the forest. Before leaving, you stop in the side courtyard of the ground floor to find the sun setting behind an old library. Angkor Wat’s southeast library is especially mystical at the end of the day. 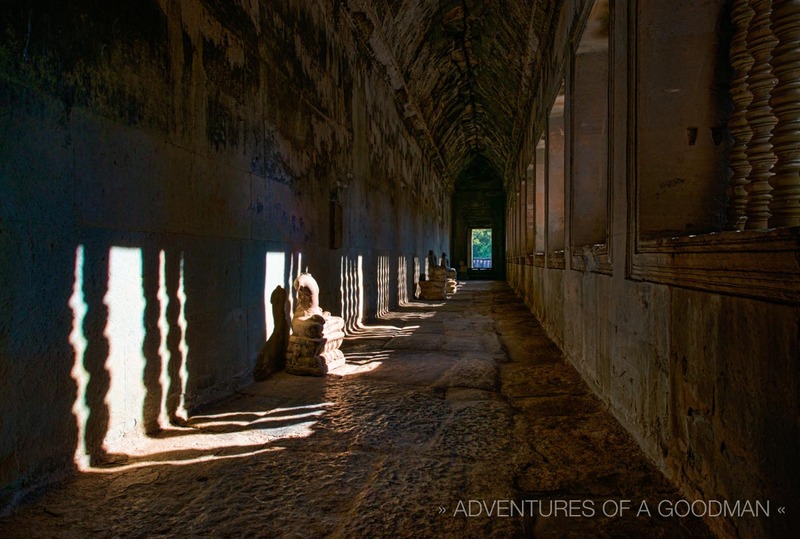 Yup … there’s actually a back door to Angkor Wat. Even better, it’s devoid of tourists! The back entrance to Angkor Wat. A lone monk photographing the back entrance to Angkor Wat. Aren’t you glad you avoided that tourist zoo? Trying to leave Angkor Wat at the end of the day is like being stuck in a human traffic jam. After your incredible day inside Angkor Wat, you decide that the only way to truly cap off your experience is with a helicopter ride. This is what you see from above. The temple complex from the window of a Helistar helicopter. Wat and where is your favorite old building?